There is a specialist niche form of finance available to accountants who raise fee notes as they undertake work for their accountancy clients. These notes are not invoices, they are just a record of work that has been undertaken. However, funding can still be accessed against them. Finance can be provided against your "fee notes", raised to keep track of the work that you are doing for your clients. This funding is provided before you raise the invoice and receive payment, injecting additional cash flow into your business - for an extended period of time, as explained below. The funding can be provided for up to 6 months (a very extended period of time), so it can be useful in bridging the cash flow gap between undertaking the work, and getting paid by your client. Typically, a prepayment of between 70 and 80%, of the value of the fee notes, can be made available to you. Accountancy practices are likely to have a turnover in excess of £500K per annum, in order to qualify, and more than one partner. However, if you don't meet those criteria we may still be able to find you the funding that you need, so please don't hesitate to get in contact with us. To give you an idea of the funding levels that might be achieved, if you had outstanding fee notes of say £100K, a prepayment of 80% could release up to £80K in one lump sum (note that there may be other deductions made in some cases - details can be provided on application). That could be a significant amount of additional working capital made available to your business. You simply draw down the funds into your normal bank account and use them as you see fit. You can use the advance for any purpose, this can include as acquisition finance, to assist in the acquisition of other accountancy practices. 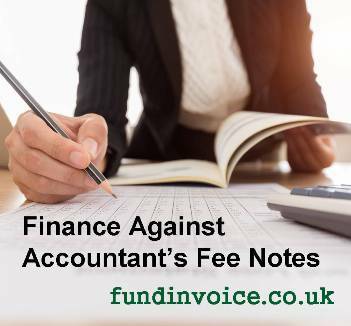 If you are interested in finance against fee notes for your accountancy firm, please get in touch with us for a price quotation. Previous article about (note the parameters were slightly less generous than this offer): Funding against accountant's fee notes.